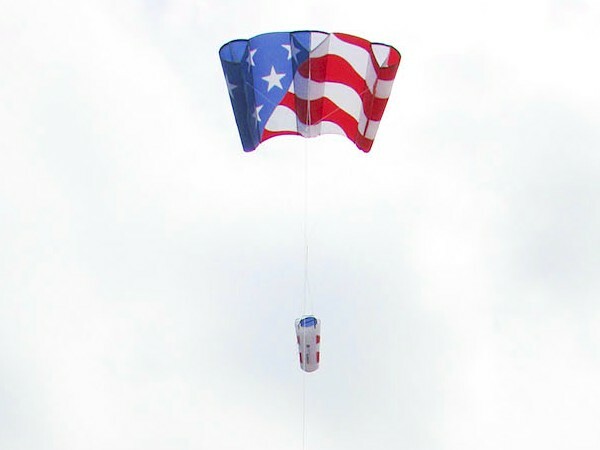 This bold Red, White & Blue applique design is an easy to fly kite which packs down into its' drogue chute carry-bag. The Power Sled 24 is a good lifter and will support all sorts of line laundry. The Sled can be flown with twin tails or a 75ft Banner Tail, with drogue removed. Simple bridle with no frame to assemble. The drogue tail, which the kite packs into for transport, makes this kite a good stable lifter. Size: 95" wingspan x 45"